Thousands of children and adults face teeth that are wearing down, a bite that is not fitting properly or teeth that are difficult to floss. Orthodontic treatment can be successful at any age, and adults especially appreciate the benefits of a beautiful smile. It can help align teeth for bridges, crowns, and implants and give you that smile you deserve. Tooth care dental clinic offers alternatives to traditional teeth straightening metal braces which are embarrassing to show up. Clear path and Invisalign utilizes a series of clear, removable retainers to shift teeth into a more aesthetic position, so no one knows you’re receiving orthodontic treatment except for you.The alignment of your teeth will produce stunning, pearly whites, but maintaining this alignment after Invisalign treatment is integral to overall dental health as well. Invisalign braces relies on a series of smooth, comfortable plastic aligners to straighten your teeth gently and gradually. 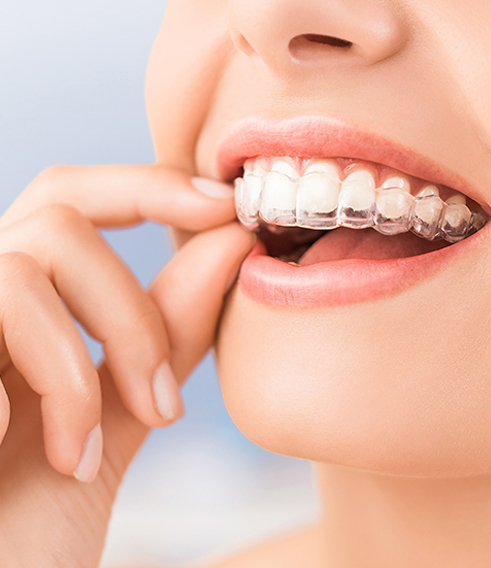 Invisalign treats Tooth Crowding, Spacing Concerns, Cross bite, Overbite, and Underbite. Invisalign requires fewer visits than other teeth straightening techniques.